I was lost and overwhelmed with Violets diagnosis journey. She now had a confirmed chromosome disorder but we knew there was more to it. I had become a hermit. Only staying at home and I felt such guilt that both V and H were missing out. My volunteer came with me to different places that I wanted to try. These included a local sensory room at a children centre, swimming pool and playgroup. It was bittersweet. It was lovely to get out with them both but also highlighted to me that it was really hard even with help. The playgroup was a disaster, access to the sensory room was very difficult and swimming was very tricky. In the pool was fine but it was the changing before and after for Violet that was a nightmare. Too big really for the baby change table (on the wall type) meaning I had to lay her on the wet floor on a towel. These are things you don’t consider or even think about when you have a fully able child that can sit and stand. So I had gained a bit of confidence but had also had a massive realisation that our life was never going to be straightforward. Trips out and activities needed a lot of planning in advance, they always will. 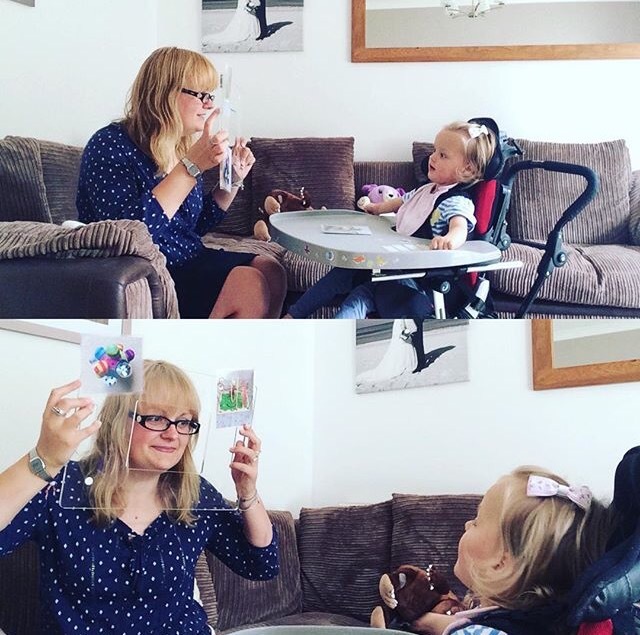 We had play sessions for V which introduced Violet to a lot of sensory toys and were a nice fun activity for her. These ceased with Early Years when the portage programme came onboard. Our portage worker is amazing. A wonderful woman who cares deeply about her role. We are lucky to still be under the service and Violet has completed 2 long term goals that have been set for her. These were to vocalise when she has had enough of an activity and to be able to choose from 3 toys using an E Tran board. We are setting her 3rd goal this coming week. Vs sessions include working towards goals through play and activities. Violet loves it!